Archive by category "Fox News"
As Fox News continues their celebration of Paul Ryan as Mr. Romney’s VP pick, commentator KT McFarland is in awe during a segment with John Roberts. MCFARLAND: Look, it’s a brilliant foreign policy choice. Why? For three reasons. One, you know, the biggest problem America faces, the biggest national security problem we face, according to the former Chairman of the Joint Chiefs of Staff is the economy. If we don’t fix the economy, foreign policy is collateral damage. So first fix the economy. And people forget that my boss, Reagan, in the first Reagan term, Reagan fixed the economy. He didn’t take down the Soviet Union until the second term. So first, fix the economy. The second thing is, America’s immediate problem in foreign policy is Israel and Iran. Now, the United States and Israel have to see eye to eye on how to deal with Iran. If they don’t see eye to eye, than Israel could be tempted to go off on its own, start a war with Iran that they can’t finish that we have to finish. The closest relationship is between Romney and Netanyahu. They’ve known each other for forty years. They are on the same page. They may not always agree, but they’re on the same page. And, you know John, as far as who’s the foreign minister of Kazakhstan, what Romney can do is appoint a blue ribbon committee of wise men. Get Henry Kissinger, who opened China, did the first Middle East negotiations. Get George Schultz, ended the Cold War. Get Jim Baker, won the first Iraq war. Have them be a wise men committee to vet whoever the foreign policy picks are for the Cabinet. So, no, this is a great foreign policy choice, because it shows that America can solve it’s problems and we’re back. ROBERTS: Quick answer if I could ask you for it KT, this idea of American exceptionalism as well, in a talk before the Council on Foreign Relations, Paul Ryan said “Obama (the President) doesn’t think America is an exceptional nation. It’s a shame he doesn’t believe in American exceptionalism.” Is this idea of America being bigger than everybody else and stronger than everybody else really play into our national security going forward? During a recent appearance on Fox News’s Sean Hannity Show, Sarah Palin accused the media of “prostituting themselves” in order to gain access to the Obama administration for potential interviews. 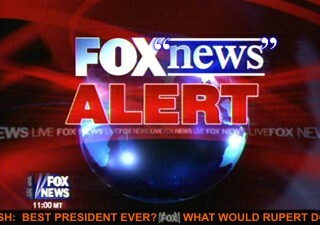 In response to stories like Hurricane Irene or the DC quake on the Fox News web site, viewers took the opportunity to voice their opposition to Obama and his socialist policies. Many readers expressed concern over Obama’s vacation from the basement of their moms house, known for their patriotism these comments reflect what real Americans think. “If anyone could make the whole eastern seaboard tremble it’s Obama” exclaimed one patriot, said another “that’s the rumble of Obama’s Marxist troops coming for your guns!” Did Obama blame George W Bush for the damage done to the Washington monument? Whose “fault” is it? Fox News viewers want to know. Sometimes opinions alone cannot fully convey the point of how these patriots really feel. With a lot of time on their hands due to Obama’s job killing agenda researching sites like drudgereport, newsmaxx and breitbart.com to cite non-partisan facts on global warming, ACORN and Planned Parenthood’s “90% of what they do is abortion” only serve to bolster their credibility. It’s been nearly three years and though we’re still waiting for Obama’s Marxist troops to march down our neighborhood streets to take our guns, it’s still coming. Like any other red blooded patriot, I watch Fox News and back in 2008 they warned us so me and all my patriot brothers bought every gun and all the ammo Wal-mart had to offer and took up arms. 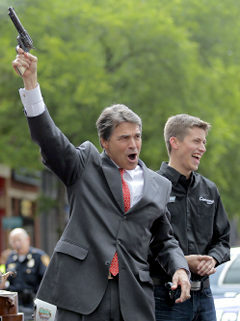 Well as it turns out, if we can hold our just another year and vote for Rick Perry we won’t have to worry. We will be able to emerge from our bunkers and get a free handgun with every purchase of a 5th of JD from our local liquor store. Hang in there patriots, soon we’ll be able to keep the guns we’ve never lost.